Emillé takes its name from a giant, ornate bell that is considered a national treasure in its native Korea. Its range of well thought-out integrated, pre/power amplifiers and phono stages is entirely valve-based and has worn commensurately high-end price tags up until now. The £2,450 Ara is not exactly cheap, but is comfortably Emillé's least expensive integrated amp ever and targets a rather more accessible and competitive price point. The good news is that there is little sign of cost-cutting. The Ara is built in the same factory as the larger amplifiers and there is little sense at any stage that this is a 'poverty spec' product. The valve complement differs from the rest of the range and, in fact, differs from most other valve amplifiers on the market. Alongside a relatively normal choice of 6922 valves for the preamp section, the Ara makes use of four 7591a valves for the power section instead of the more usual choices of EL34 or KT88. These endow the Ara with an output of 22 watts at credible distortion levels. While not a huge amount of power, the 20-watt boundary is an important one in terms of system-building and gives the Ara the ability to work with speakers with sensitivity in the high 80s, as well as more specialised 90dB/w plus designs. The other very interesting feature can be found nestling unobtrusively on the rear panel. As well as a pair of RCA line inputs, the Ara is fitted with an SP/DIF and a USB input. This is not something we have ever seen before on a valve amp and makes the Ara rather more flexible in connectivity terms than might otherwise be expected. The digital board is entirely solid-state and makes no use of any additional valves. The feature set is rounded-off with a headphone socket and remote control for the volume. Slightly limited number of analogue inputs aside, this is a well-specified product with considerable flexibility in how you might go about using it. Aesthetically, the Ara is designed in the Emillé house style. Two large knobs serve as the power switch and input selector, while the central knob is the volume control. A full-sized covering cage is supplied to protect the valves which does make the Ara respectably childproof. We tested without the cage in situ, as we preferred the appearance, but given the cage is included in the asking price, it is a useful thing to have. Fit and finish is also very good. Controls move with a precise and solid feel, the panel gaps are minute and the connections on the back are high-quality and rock-solid. 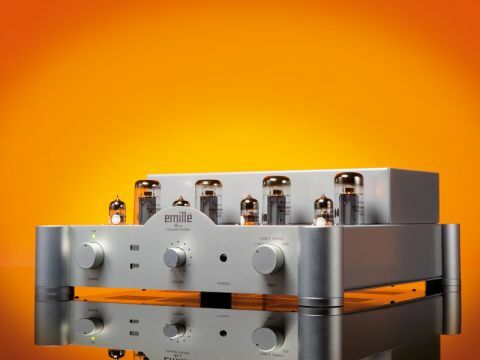 If the Ara was a 'normal' valve amplifier with only analogue inputs, it would be good value. With the unique options afforded by the digital inputs, it looks more like a bargain – depending, of course, on how good those digital inputs are, more of which later. Starting by listening to the standard analogue inputs, the Ara makes a convincing case for itself. There is no sense of excessive warmth or bloom to performance or any other stereotypical 'valve sound' traits. The Ara has an incisive, detailed and fabulously real presentation. There is no softening of frequency extremes or flabbiness in the bass which allows the Emillé to demonstrate superb timing that is better than many solid-state amplifiers. The Ara makes good use of the 22-watt output and should generate all but the most ballistic of listening levels from speakers of reasonable sensitivity. At the same time, there is a sense of space, air and presence to vocals and instruments that is hard to realise with anything other than a well designed valve amplifier. Vocals, in particular, are staggeringly well presented, never separated from instruments or their surroundings, but completely attention-grabbing and placed perfectly in a wide and believable soundstage. Given that the digital input board on the Ara represents the company's first attempt in the field of digital reproduction, we were not entirely sure what to expect. The USB is not an asynchronous type and neither will it handle hi-res formats, but it connects correctly to both PCs and Macs and proves silent and stable in use. More importantly, the performance is excellent. The overall sonic balance of the Ara is unchanged by the digital inputs which is superb achievement. There is something surreal and yet strangely satisfying about seeing the Ara turn in the same superb performance it does from the analogue inputs, from a laptop playing your iTunes collection. There is always a sense that performance of this nature ought to be something that entails more fiddling around or sacrifices in convenience. The Ara rejects this thinking entirely. The electrical digital input is if anything, even better. A fair amount of listening was conducted with the unlikely partnership of an £80 Pure i-20 connected digitally to the Ara. This duo proved a very happy one. Fed on a diet of AAC lossless files, the Ara loses none of the captivating detail and timing from this compact source and the 21st-century slickness of the iPod interface sits brilliantly with the retro tech of the Ara. CD proved equally satisfying. The digital inputs are an interesting feature. If you are using a high quality standalone CD player, the Ara will have to be considered as a two-input amplifier with a digital board that might prove useful going forward. If you are considering a more wholesale upgrade to your system, the Ara is superb value for money. If the performance over the analogue inputs is to your liking, the digital inputs offer sound quality comparable to most £1,000 sources and allow the connection of streamers, iPod docks, or a CD player with a digital output. The Ara is a superb amplifier and the combination of well implemented 'old' technology and latest thinking is one that we like very much and highly recommend.